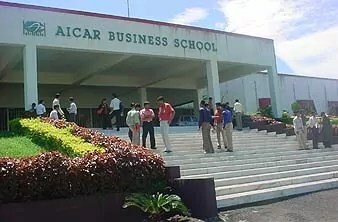 Asian Institute of Communication and Research , AICAR Business School was set up eleven years ago by a group of eminent corporate citizens, who had dedicated themselves to establish a world class, residential center of learning that would establish unparalleled standards of management and communication practice. It’s quite simply to “develop and create world class quality leaders and communicators capable of providing leadership in all spheres of commerce and service in any part of the world”. Leadership is a function of what we communicate to ourselves and others. It is ultimately related to one’s world view – one’s beliefs and the way one looks at things. Richard Bach, the author of “Jonathan Livingston Seagull “ says it all. We seek to ‘lend wings’ to our students – help them discover and awaken their native intelligence and nurture them so they can fly. The Gull is our mascot. Our philosophy of “learning-by-doing” is built on a single premise: Learning becomes real when it opens the mind and enables it to question. That is when Learning becomes transformative. This belief has led us to evolve a pedagogy that seeks to not only develop skills and clarity of concepts but also work on students’ perspectives and their belief systems. The learning process at ABS Mumbai includes academic sessions in various domains; Integrated learning which weaves various disciplines to develop a holistic perspective; experiential sessions and practices to develop personal mastery and action learning, including both live projects and leadership practice through student quality circles. A Photocopy of CAT/CMAT/ GMAT/MAT/XAT score card.